The global economic downturn and rising debt levels in all European countries have put immigration at the forefront of many debates surrounding public spending. While immigration fed economic growth in numerous European countries in the early 21st century, governments now are being forced to make cuts across the board, and they will continue to come under significant pressure to do so. Perceptions of immigration’s role in the economy have had both policy and political ramifications: a number of countries have tightened immigration policies over the past two years and others have seen populist parties capitalize on the idea that immigration is fueling native unemployment, unraveling national identities, and undermining the solidarity inherent in national social models. This report presents a diversity of findings with regard to governments responses to immigrant integration organization, financing, and programming across Europe. Yet the political and economic climate remains an incomplete explanation for the wide range of policy choices being made across Europe. 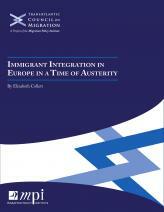 National attitudes regarding the role of immigration in national society, the extent to which integration is “embedded” in national policymaking and infrastructure, and a possible “fatigue” on the part of countries with more immigration experience may all feed shifting approaches to integration policy.